Wagtail‘s latest feature is called the ‘StreamField’, currently only available in the 1.0 Beta 1 version, but clearly a bit of a Django CMS game changer. It allows the editor to assemble a flow of page content of varying types (‘Blocks’ defined by the developer) in any order / combination they wish, kind of a Sir Trevor / Tumblr style affair. It comes with a good selection of default block types, but it’s easy to repurpose these to create things like a Twitter Widget block. In this guide I’m going to add a StreamField to an existing page class, which allows the user to add headers, paragraphs, images and a Twitter Widget to the page in any iteration they choose. The Twitter Widget I’m talking about is the one you can generate from your twitter settings by going to https://twitter.com/settings/widgets when logged in. The user will be able to specify their twitter username, widget ID and a limit to how many latest tweets to display. The same principle could be applied for also adding Soundcloud, Instagram or whatever widgets, especially useful if you want a social media rich page, which has your content mixed in with feed content from the social media sites you use. We’re just making our own class based on the StructBlock (one of the built in types) and setting up the fields we need for our widget. The other thing I like is you can specify a template for your widget at this point, and choose an Icon, I’ve gone with a Cog, but there are plenty of others. The Label is useful to tell the users what it is once it’s part of the interface. Next go to your page class where you want the StreamField to appear, and add the code below with other existing fields. 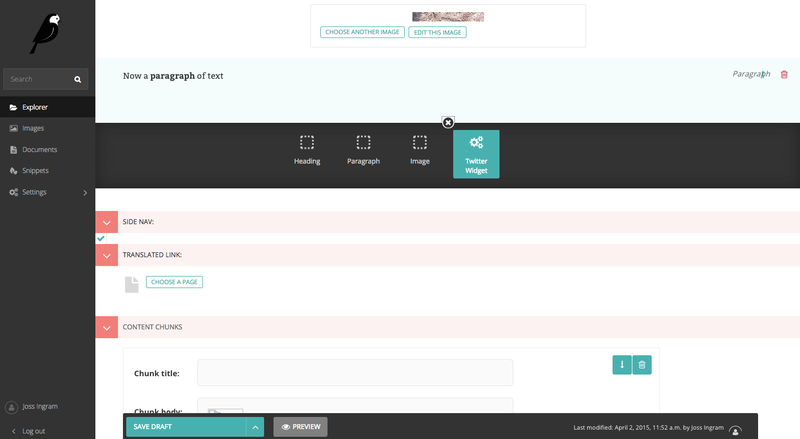 This sets up our content field which can have a Header, Paragraph,Image or twitter widget. The final step is to obviously take care of the templating part! You’ll need to add a new folder called ‘blocks’ in the template folder of your app, in the location we referenced earlier when defining the block, then create twitter.html as below. Hopefully this might help someone, let me know of any mistakes.